No visit to Milan is complete without a tour of Cimitero Monumentale, where the Milanese celebrate death. Sounds a bit creepy, weird and morbid? Just think pyramids in Egypt or Taj Mahal in India. Dating back to 1866, Milan’s Monumental Cemetery pays tribute to human spirit regardless of religion. Actually, two newer parts were built to host Jewish and non-Catholic Milanese citizens having contributed to the city’s history and urban life. Apart from the obvious religious character, the churchyard is a full-blown open-air museum, an ode to art, history, culture and – typically Milanese – sometimes also ostentation. 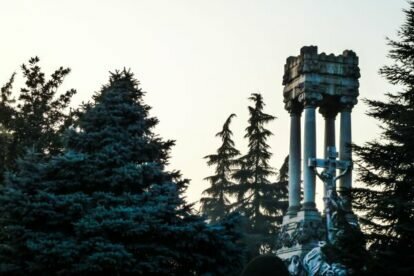 Having found their final resting place on Cimiterio Monumentale many of the Milanese elite (past and present) celebrate themselves in grand style with monuments commissioned for well-known artists and designers like Pietro Cascella, Giò Ponti and many more. Walking past the graves takes you on a tour-de-force through Italian art history. Full of stunning architecture, impressive tombs, park-like avenues, little woods, quiet corners and thousands of sculptures, the churchyard is vast, beautiful, one-of-a-kind. Despite all the displayed human aspiration of leaving a mark, the Milanese Monumental Cemetery is an oasis of peace, contemplation, serenity and tranquility. It is a working cemetery, thus, you will see people taking care of the graves of their loved ones. Located just North of Chinatown and being the second most visited sight in Milan, Monumentale is never crowded, oftentimes I’ve walked down the aisles without meeting anybody else. Just like meditating. Short & simple: the most beautiful cemetery I’ve ever seen!